The Prospect Spring site is on private land and it is not open to the public. The site was intially investigated by the Center for Archaeological Research at Missouri State University during 1991 and 1992. SCI Engineering conducted excavations in the portion of the site impacted by the highway construction during 2012. "The occupants of the Prospect Spring site from Late Archaic through Late Woodland/Mississippian times were focused on the procurement of nuts, but particularly hickory nuts and perhaps acorns. Other nuts such as walnuts and hazelnuts were procured to a far lesser extent, serving as supplemental resources where and when available. Other than the collection of nuts, the archaeobotanical record is mute with respect to any evidence for seed exploitation, much less food production" (Lopinot 2013:129). 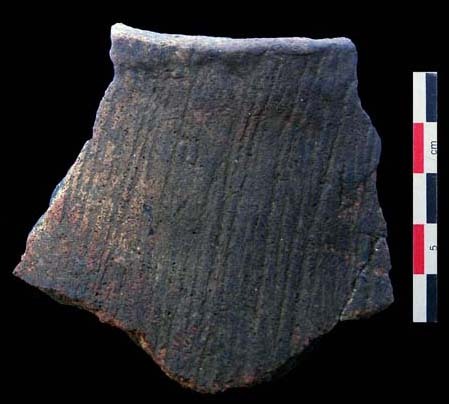 The archaeological team from Missouri State University collected a radiocarbon sample from of red oak charcoal Feature 4 (a fireplace) that yielded a cal C-14 date of AD 837 (Beta-45331). 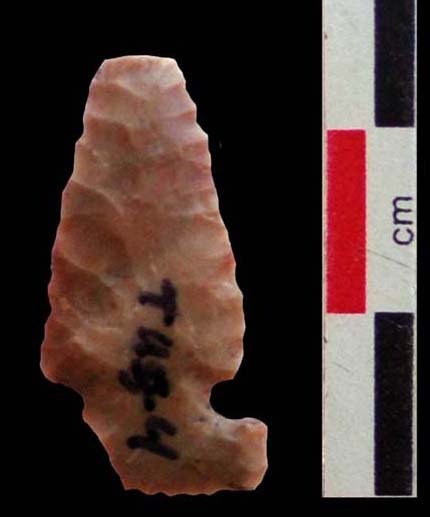 It was associated with arrow points and shell/limestone tempered pottery (Ray and Benn 1991:26). Edible food remains in the fireplace included carboned hickory shell and acorn. 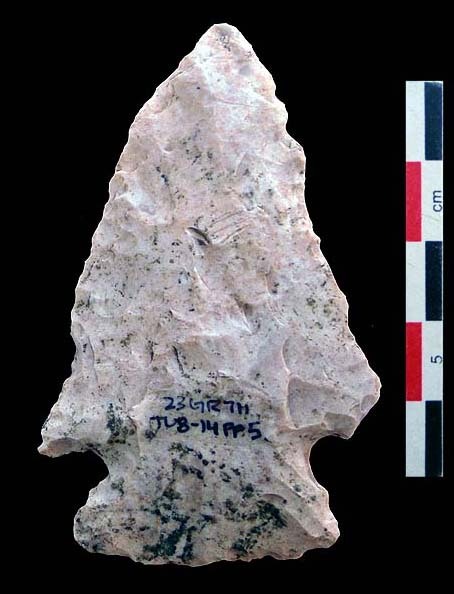 The date for Late Archaic occupation at the site can be inferred as 3000 - 1000 BC based upon parallels of the stone tool technology with other dated sites in Missouri. 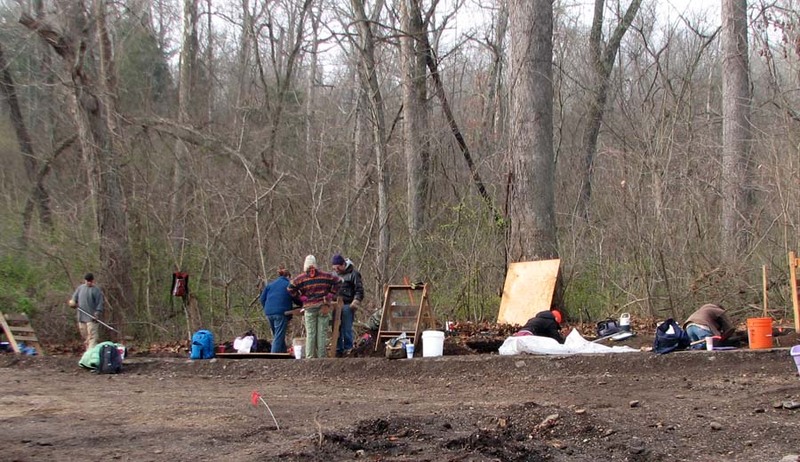 Prospect Spring site during excavation by SCI-Engineering during 2012; photograph provided by Don Booth. 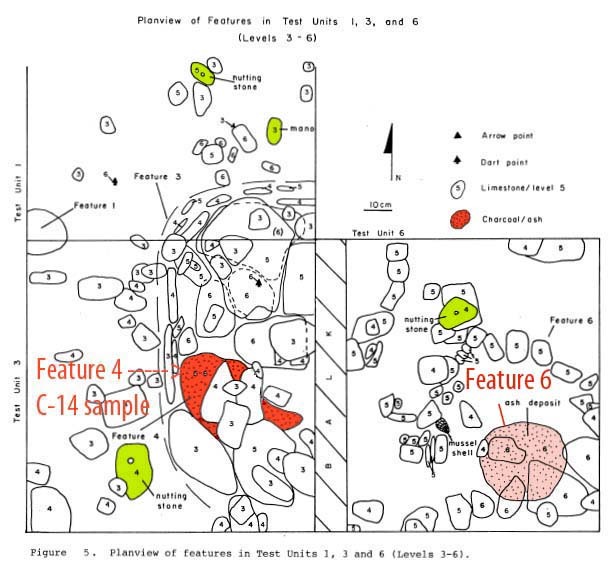 Features 3 (rock lined pit) and 4 (hearth) at 60 to 65 cm below the surface; excavated by the Center for Archaeological Research at Missouri State University during 1991 (Ray and Benn 1991: Figure 7). The C-14 date came from Feature 4. Planview of features and artifacts exposed by CAR-MSU. (Ray and Benn 1991: Figure 5). Three nutting stones and one mano were located around Feature 3. 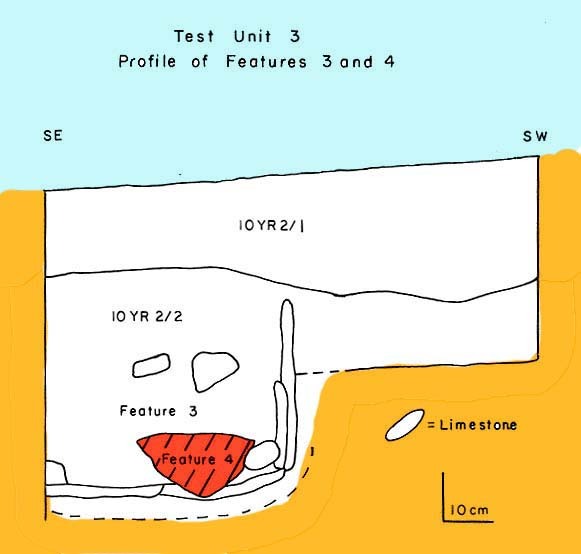 Profile drawing of Features 3 and 4 excavated by CAR-MSU (Ray and Benn 1991: Figure 6). 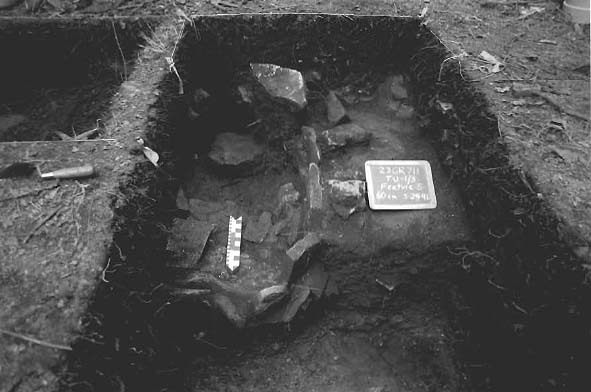 Feature 3 was interpreted by the excavators as "a large cooking facility for meat (primarily white-tailed deer (Odocoileus virginianus)) processing as well as for the roasting of hickory and other nuts" (Ray and Benn 1991:22). Other bones identified at the site include beaver (Castor canadensis), opossum (Didelphus marsupialis), raccoon (Procyon lotor), groundhog (Marmota monax), pocket gopher (Geomys bursarius), turkey (Meleagris gallopavo), box turtle (Terrapene ornata) and bison (Bison bison). One large first phalange may have been from an elk (Cervus canadensis). 1996 The prospect Spring Site and the Problem of the Late Woodland/Mississippian Transition in the Western Ozarks. Midcontinental Journal of Archaeology 21(1): 49-78. 2013 Prospect Spring Flotation Sample Analysis in Phase Three Data Recovery at Prospect Spring Site (24GR711). SCI Engineering - O'Fallon, Illinois. Moffat, Charles R., Edwin Hajic and Don Booth. 2013 Phase Three Data Recovery at Prospect Spring Site (24GR711). SCI Engineering - O'Fallon, Illinois. 1991 Phase II Test Excavation at the Prospect Spring Site, 23GR711. CAR report 838 - Missouri State University. Thank you to Don Booth for making the diagnostic artifacts available for study and photography. STLCC students in Field Methods of Archaeology assisted in measuring and describing the artifacts. Special thanks to Ettus Hiatt for assistance in editing the website text.